GGPlotD is a plotting library for the D programming language. The design is heavily inspired by ggplot2 for R, which is based on a general Grammar of Graphics described by Leland Wilkinson. The library depends on cairo(D) for the actual drawing. The library is designed to make it easy to build complex plots from simple building blocks. 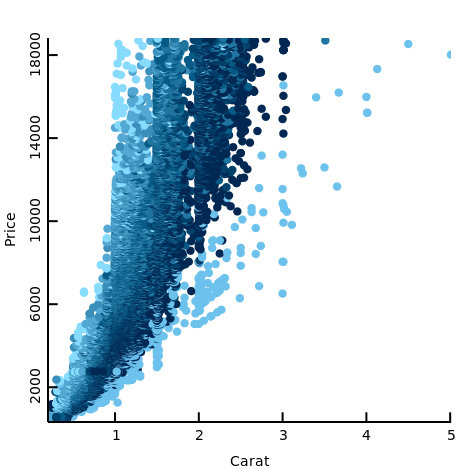 Let’s assume we have a csv file with data on the price, carat and clarity of different diamonds. We can simply plot this data as follows. For the next example let’s assume that we have three different variables (e.g. 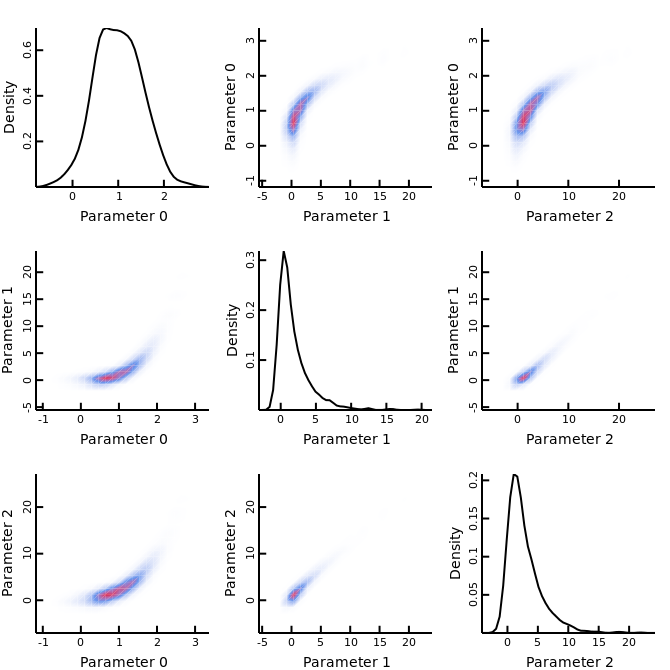 as a result of an MCMC run) and we want to plot the variance-covariances to get a sense of how these variables/parameters relate to eachother. This could be done as follows. Due to GGPlotD’s design it is relatively straightforward to extend GGplotD to support new types of plots. This is especially true if your function depends on the already implemented base types geomType, geomLine, geomEllipse, geomRectangle and geomPolygon. The main reason for not having added more functions yet is lack of time. If you decide to implement your own function then please open a pull request or at least copy your code into an issue. That way we can all benefit from your work :) Even if you think the code is not up to scratch it will be easier for the maintainer(s) to take your code and adapt it than to start from scrap. The stat* functions are meant to calculate different statistics from data. The results should be an range of aesthetic mappings that can be passed to a geom* function and plotted. There are a variety of existing functions (statHist, statDensity, statFunction etc.). Of course if you have written your own then you are encouraged to open a issue/pull request on github to submit them for inclusion, so that others can benefit from your good work. 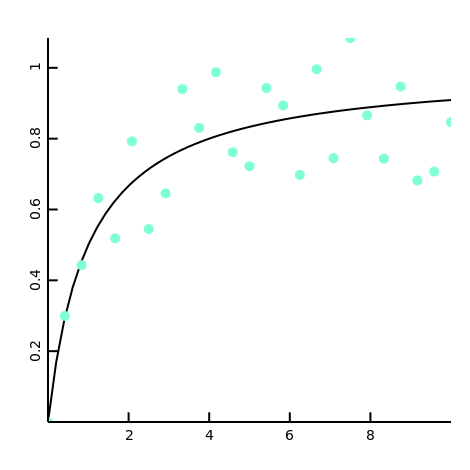 See below for an example of a plot created with the statFunction, which makes it straightforward to draw different functions. The goal of each stat funtion should be to return an aesRange that can be drawn with a variety of different geom functions. Still in many cases the results can only really be drawn in one way. In that case it might make sense to design your function in a way that is drawable by geomType. GeomType makes it easy to define the type of plot you want, i.e. a line, point, rectangle etc. A geom function reads the data, optionally passes the data to a stat function for transformation and returns a range of Geom structs, which can be drawn by GGPlotD(). In GGPlotD the low level geom function such as [geomType](http://blackedder.github.io/ggplotd/ggplotd/geom/geomType.html), [geomPoint](http://blackedder.github.io/ggplotd/ggplotd/geom.html#geomPoint), [geomLine](http://blackedder.github.io/ggplotd/ggplotd/geom.html#geomLine), [geomEllipse](http://blackedder.github.io/ggplotd/ggplotd/geom.html#geomEllipse), [geomRectangle](http://blackedder.github.io/ggplotd/ggplotd/geom.html#geomRectangle) and [geomPolygon](http://blackedder.github.io/ggplotd/ggplotd/geom.html#geomPolygon) draw directly to a cairo.Context. Luckily most higher level geom functions can just rely on calling those functions. For reference see below for the geomHist drawing implementation. Again if you decide to define your own function then please let us know and send us the code. That way we can add the function to the library and everyone can benefit. Note that the above highlights the drawing part of the function. Converting the data into bins is done in a separate bin function, which can be found in the code. Currently a couple of heightmap/surface geom* functions are implemented (geomHist2D and geomDensity2D). Both rely on the geomPolygon function to do the actual drawing. The geomPolygon function allows one to draw gradients dependent on height/colour. This function plots any straight/flat polygon, with the colour representing the height of the surface. 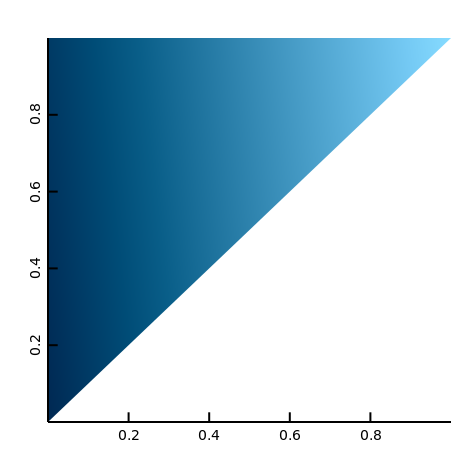 Note that the function does not check whether the provided surface is flat. Because triangles are by definition straight it might be good to limit your usage to triangles, unless you are completely sure your polygon has no curves. If you want to use ggplotd to draw the plots, but keep the plot in memory, you can create an image surface and use drawToSurface to draw to it, without saving it to file. // Do what you want, i.e. add lines, add points etc. // depends on what you need to do with it afterwards. A 2D version of the histogram is also implemented in geomHist2D. Note that we use another colour gradient here than the default. Finally there are examples available in the online documentation. Mainly here and here. Actual development happens on github, while planning for new features is tracked on trello. Feel free to join the discussion there. Wilkinson, Leland. The Grammar of Graphics. Springer Science & Business Media, 2013.